The large, barrel-chested man stripped to the waist for a fight on Ladies Day. Footage of a half-naked, inebriated man fighting a fellow reveller at Ascot has gone viral after being posted online. 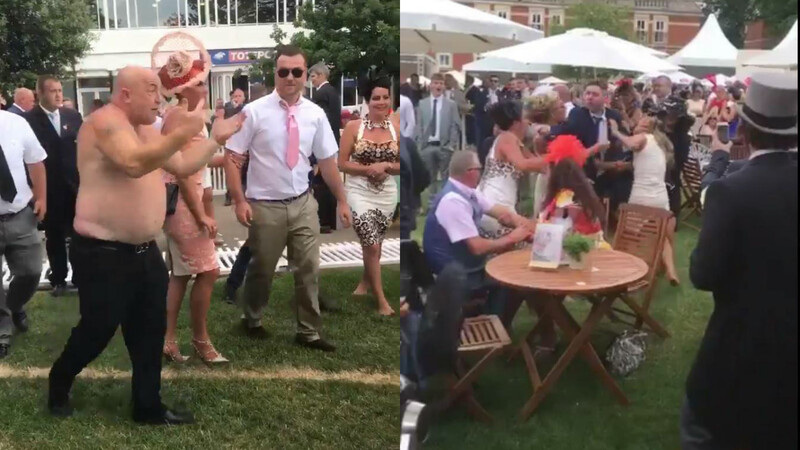 The bald, middle aged man was filmed with his fists up, shouting “let’s finish it off” in the clip as he approached another punter during a busy and booze-fuelled Ladies Day at Ascot. Ladies Day has something of a reputation for drunken antics, with any number of fights, slips and racy behaviour witnessed at the annual day of racing. Onlookers could only watch as the pair clashed at the Berkshire racecourse. Having stripped off and issues his memorable battle cry, it would appear that the bald, drunk man won the day, with his fellow combatant seemingly waving the white flag after holding his hands up and backing away from the confrontation. They weren’t the only pair to clash in the clip though, with several female guests also caught tussling in the footage. In one instance, the confrontations turned ugly with one woman ending up floored after either being pushed or, worse still, knocked to the ground. Eventually, Ascot security stepped in to calm everything down, with the confrontations reportedly occurring after the final race of the day. It’s not the first time this kind of antics have made the headlines. Back in 2011, a similar set of clashes saw male guests brandishing expensive champagne bottles as weapons. Thankfully, nothing that serious happened this time round – though not for the want of trying on the part of the bald party-goer.